Notice above how the SPROC defines the "OrderID" parameter as an output param. This is because the OrderID column in the database is an identity column that is set to auto-increment each time a new record is added. The caller of the SPROC will pass in NULL as a value when calling it - and the SPROC then passes back the newly created OrderID value as the output value (by calling the SCOPE_IDENTITY() function at the end of the SPROC). The LINQ to SQL designer will populate a parameter list for the SPROC we picked, and enable us to map properties on our Order class to parameters of our InsertOrder SPROC. By default it is smart and tries to "best match" them based on name. You can go in and override them if you want. Once we click "ok" on the dialog, we are done. Now whenever a new Order is added to our DataContext and the SubmitChanges() method is invoked, our InsertOrder SPROC will be used instead of executing dynamic SQL. Important: Even though we are now using a SPROC for persistence, the custom Order "OnValidate()" partial method we created earlier (in step 1 of this blog post) to encapsulate Order validation rules still executes before any changes are saved or the SPROC is invoked. This means we have a clean way to encapsulate business and validation rules in our data models, and can re-use them regardless of whether dynamic SQL or SPROCs are used. Now let's modify our Customer object to handle updates using a SPROC. Notice above how in addition to passing in the @CustomerID parameter, we are also passing in a @Original_CustomerID parameter. 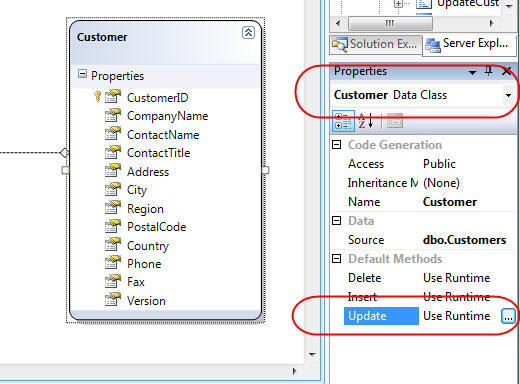 The CustomerID column in the Customers table is not an auto-increment identity column, and it can be modified as part of an update of the Customer object. Consequently we need to be able to provide the SPROC with both the original CustomerID and the new CustomerID in order to update the record. 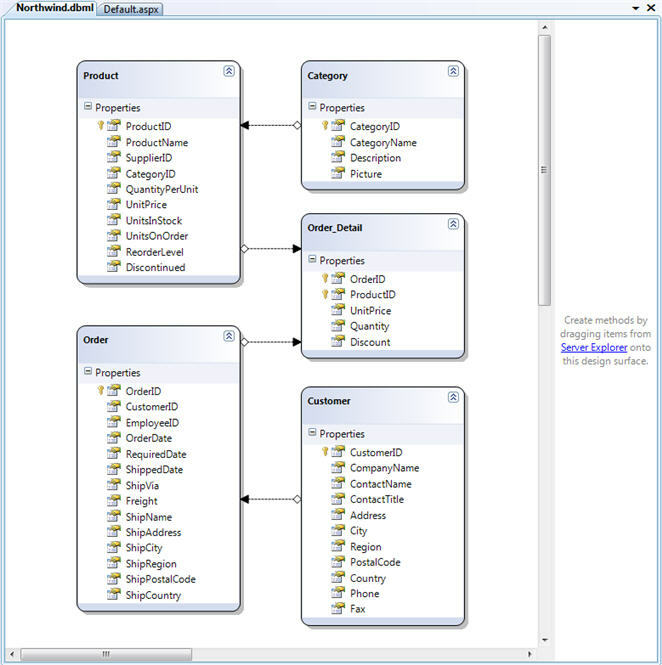 We'll look at how we map this using the LINQ to SQL designer shortly. You'll notice above how I'm also passing in a @Version parameter (which is a timestamp) to the SPROC. 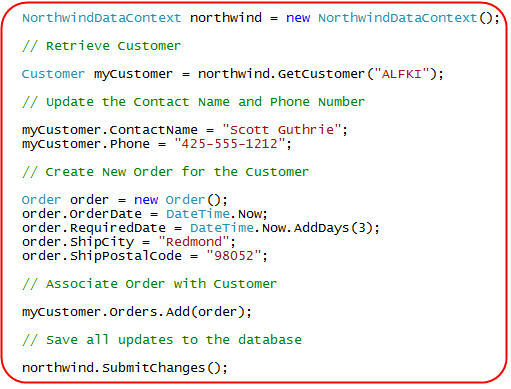 This is a new column I've added to the Northwind Customers table to help handle optimistic concurrency. I will cover optimistic concurrency in much more depth in a later blog post in this LINQ to SQL series - but the short summary is that LINQ to SQL fully supports optimistic concurrency, and enables you to use either a version timestamp or to supply both original/new values to your SPROCs to detect if changes have been made by another user since you last refreshed your data objects. For this sample I'm using a timestamp since it makes the code much cleaner. When mapping our Customer object's properties to the SPROC parameters, you'll notice that we'll want to be deliberate about whether we supply the "current" property value on the data object, or the original value that was in the database when the object was first retrieved. For example, we'll want to make sure we map the "current" value of the Customer.CustomerID property for the @CustomerID SPROC parameter, and that we map the original value for the @original_customerID SPROC parameter. Once we click "ok" on the dialog, we are done. Now whenever a new Customer is updated and the SubmitChanges() method is invoked, our UpdateCustomer SPROC will be used instead of executing dynamic SQL. Important: Even though we are now using a SPROC for persistence, the Customer "OnPhoneChanging()" partial method we created earlier (in step 1 of this blog post) to encapsulate Phone Number validation rules still executes before any changes are saved or the SPROC is invoked. We have a clean way to encapsulate business and validation rules in our data models, and can re-use them regardless of whether dynamic SQL or SPROCs are used. Now the updates for the Customer object, and the insert for the Order object, are executing via SPROCs instead of dynamic SQL. The validation logic we defined still executes just like before, though, and the data access code we write to use the data model classes is exactly the same. In the Insert scenario (Step 3) above I showed how we could return back the new OrderID value (which is an auto-increment identity column in the Orders table) using an output parameter of the SPROC. You aren't limited to only returning back identity column values when using SPROCs with LINQ to SQL - in fact you can update and return back output values for any parameter of your SPROC. You can use this approach both for Insert and Update scenarios. 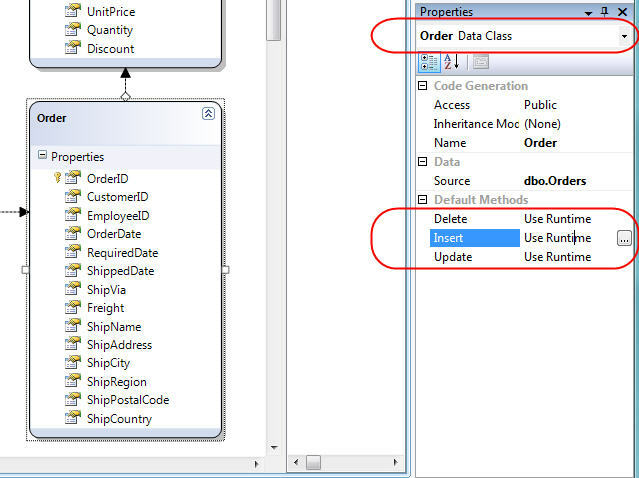 LINQ to SQL will then take the return value and use it to update the property value of your data model object without you having to-do any second queries against the database to refresh/populate them. What Happens if the SPROC Throws an Error? If a SPROC raises an error when doing an Insert/Update/Delete operation, LINQ to SQL will automatically cancel and rollback the transaction of all changes associated with the current SubmitChanges() call on the DataContext. This ensures that your data is always kept in a clean, consistent state. Can you write code instead of using the ORM designer to call SPROCs? The code above was actually what was generated by the LINQ to SQL ORM designer when we used the designer to map the SPROC and then associate the update behavior of the Customer object with it. You can use it as a starting point and then add any additional logic you want to it to make it more advanced (for example: use the return value of the SPROC to raise custom exceptions for error conditions, optimistic concurrency, etc). LINQ to SQL is a very flexible ORM. 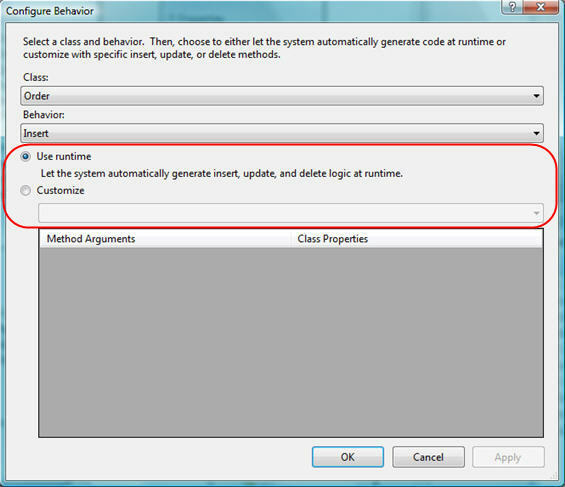 It enables you to write clean object-oriented code to retrieve, update and insert data. Best of all - it enables you to cleanly design data model classes independent of how they are persisted and loaded from a database. 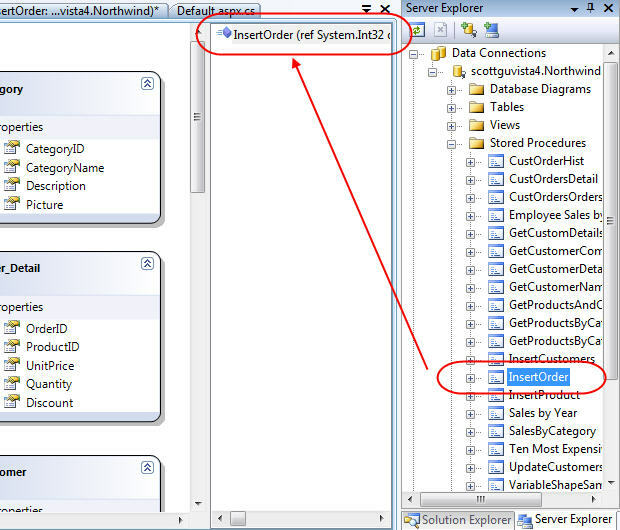 You can use the built-in ORM engine to efficiently retrieve and update data in the database using dynamic SQL. Or alternatively you can configure your data layer to use SPROCs. The nice thing is that your code consuming the data layer, and all of the business logic validation rules you annotate it with, can be the same regardless of which persistence approach you use. In future blog posts in this series I'll cover some remaining LINQ to SQL concepts including: Single Table Inheritance, Deferred/Eager Loading, Optimistic Concurrency, and handling Multi-Tier scenarios. I'm on vacation next week, and so will hopefully have some free time to get a few of them written then. Your articles alone would be great first chapters of one of the many "missing" books on the topic LINQ to SQL. Looking forward the "Multi-Tier" part. "I'm on vacation next week, and so will hopefully have some free time to get a few of them written then"
I see a problem in the UpdateCustomer sproc. 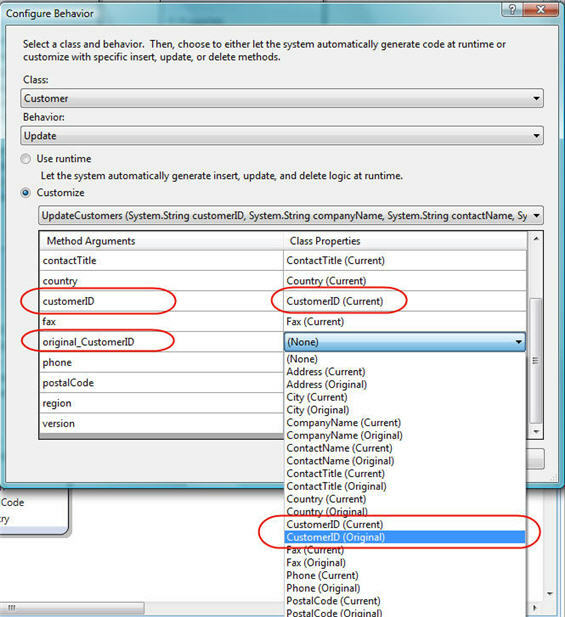 Since CustomerID is the primary key there's a (non)clustered index on that column. By using "CustomerID=@CustomerID" in the update statement SQL Server Engine drops the cached indexpages with every update. The engine is not smart enough to recognize it if the CustomerID doesn't get changed at all. This can cause a major performance issue if you update a lot of records at a time. I've experienced this one time where a batch took 28hrs to run with the update of the id and 20 minutes without the update of the id. tmho the CustomerId should never ever change anyway so it's better to drop that part of the statement. Thanks for all your tutorials! Great Tutorials indeed. BTW, when are you going to unveil your plans about MVC. 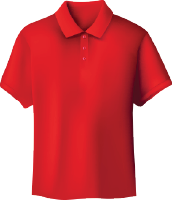 ( Model, View Controller)by Microsoft. We need to select one of the best possible ways for future...Either LINQ way or MVC way. IronLISP is also on its way on codeplex, what are your plans about Dynamic VB( VBx )..? We are waiting to hear more on this, after great LINQ tutorials. Thanks to you and the LINQ team - this is fantastic. When you wrote "LINQ to SQL will automatically cancel and rollback the transaction of all changes" this got me curious - how easy is it to control when LINQ uses transactions? Is LINQ smart about when it uses them i.e: only when there are updates? Now that I think about it I invoking SubmitChanges() is an automatic indication that a transaction is required - though I often don't use transactions for simple record updates. Just wondering what information you can supply about this! As always thanks for a fantastic blog. I have one short question though. Is it possible to turn off concurrency handeling? I do think its a nice feature, but in some scenarios i would just like updates to be done no questions asked. 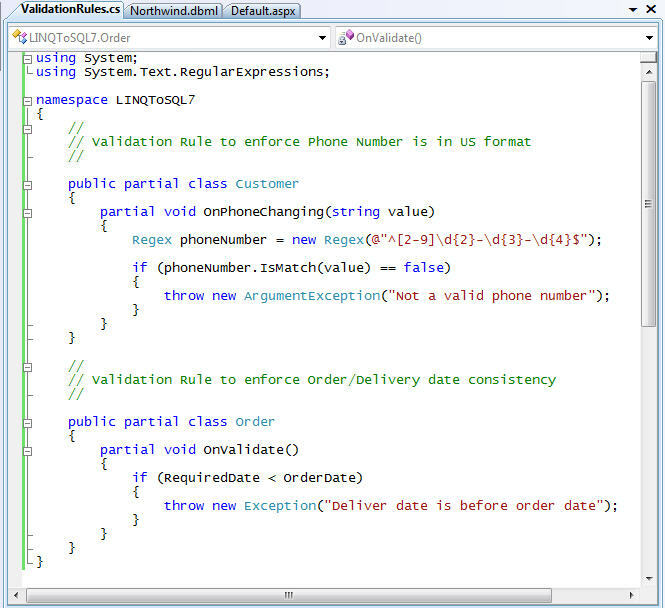 Scott, can comment at all about other LINQ providers that will be available with the release of Visual Studio 2008? great, I loved it. I have been using LINQ at my house for practice and am loving it. One question. Many a times we want to keep different names for a database column and property in the entity of same table. I mean I might want to add PK_ or FK_ fro my primary and foreign key respectively. But I don't want to have a class with such property name. How can LINQ handle these situations. My apologies on missing the second of my issues: I see you have actually replied to this point in LINQ article 6 (it was so long between the post and the reply I thought I hadn't posted it correctly!!) - we do realise you're busy and do this when you can..
Perhaps you need to get someone in your team to improve the blog engine so users get email replies as well as the blog reply? It's quite difficult to track questions+responses on the comments.. Looking forward for the future blog posts - have a nice vacation! For security reasons, the SQL login I use to connect to a SQL database only has rights to exec stored procs, it never doesn't have direct access to tables. My big concern is a SQL injection, so forcing the use of stored procs for data access gets all of our developers honest. To use LINQ to SQL, would I need to give the login access to the tables during development, even if I wanted to just use stored procs to execute? >>>>>>> Is it possible to turn off concurrency handeling? I do think its a nice feature, but in some scenarios i would just like updates to be done no questions asked. Yes. Optimistic concurrency is enabled by default, but you can turn this off completely if you want last writer wins semantics. I'll cover this as part of my post on optimistic concurrency in more detail. >>>>>>> For security reasons, the SQL login I use to connect to a SQL database only has rights to exec stored procs, it never doesn't have direct access to tables. My big concern is a SQL injection, so forcing the use of stored procs for data access gets all of our developers honest. To use LINQ to SQL, would I need to give the login access to the tables during development, even if I wanted to just use stored procs to execute? 1) Giving your developers a copy of the schema that they run locally. They can then just point their app's connection-string at the real database at deployment time. 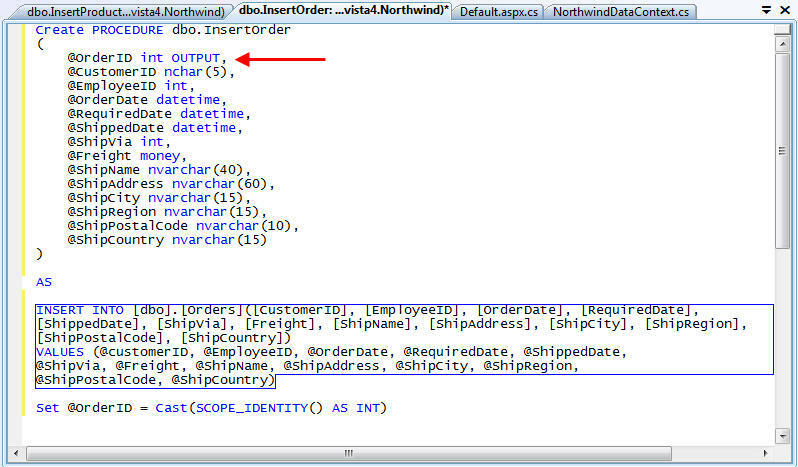 2) You can bypasss the LINQ to SQL ORM designer and write the data model definitions by hand. This prevents any need for access to the schema. While you are handling concurrency, can you also give us some good coverage on how to handle identity fields at the database level with multiple tables? For example, in datasets I have the identities setup to increment by -1 with cascading setup so that when the database generates the "real" IDs the updated values are propogated to the child tables automatically. Is LINQ going to use the same pattern? Do you have any plans to give us a blog on how to use Linq in a stateless environment like ASP which we need to use Attach(). From reading the docs, I still haven't got a clear picture how Linq technology should be used when DC has a short life, but in reality, we need to preserve it's state before it goes away, for the next sessions. Thank you again for caring to teach us this great technology! I suppose this is a bit of an old chestnut, but, in general terms are there performance benefits in using Stored procedures as compared with using dynamic SQL? As my understanding, LINQ to SQL is a layer sits on top of ADO, it parse "lambda expressions" to sql expression and using ado provider to execute the sql query? Can LINQ scale to Millions of Oracle DB Rows? If I wanted to convert my existing high performing oracle sp calls to LINQ compatible where do I start? This has become my fav blog! Great work Scott! 1. I noticed that the generated code tries to change table names from plural to singular (it removes the s). For example, if I had a table called Customers, the generated code would show Customer. However, when I added a table called CustomerStatus, it removed the s and changed it to CustomerStatu. This seems to be a bug. In any case, I always use the singular form for my table names. Is there a way to disable this feature? 2. I prefix my table names to help organize different table types (lookups, etc.). Is there anyway to remove this prefix automatically when the code is generated? Is there any reason you didn't use the following, which more closely resembles the C# code? Function() is the VB equivalent of =>, if I'm not mistaken. I've found an issue according to m:m models that I can't resolve. Let's assume that we have three tables: [Tickets] -> [TicketsOfUsers] <- [Users], the keys are TicketId and UserId, the TicketOfUsers' key contains both the other keys. My purpose is to query the Tickets of a given user. I've found three reasonable ways to do that. The hardest way to go is to manually join the main table to the join table and use the join tables reference. The result what I want to get, but why should I join the tables manually, if I have composed the model in the LINQ to SQL file? It is comfortable, gives the good result, but cannot be used, if I have more m:m constructs (eg. amongst five tables) in a query. And here comes my problem. Why does it generate the CROSS JOIN? Wouldn't it be more logical to generate INNER JOIN ... ON instead of joining the tables using a WHERE condition? As far I know, they generate the same result set, but the CROSS JOIN construct is way too slow. The JOIN ... ON construct comes back. At least it works the way I expected, but it's still not what I want. Is there a way to resolve this problem? Can I make LINQ to generate fast queries using the relations in the LINQ to SQL file? >>>>> One question. Many a times we want to keep different names for a database column and property in the entity of same table. I mean I might want to add PK_ or FK_ fro my primary and foreign key respectively. But I don't want to have a class with such property name. How can LINQ handle these situations. When you define your data model classes using the LINQ to SQL ORM designer you can rename the class name properties to be anything you want. They don't need to have the same column names as the ones in the database. If I understand your question correctly I think this gives you what you are after. >>>>>> While you are handling concurrency, can you also give us some good coverage on how to handle identity fields at the database level with multiple tables? For example, in datasets I have the identities setup to increment by -1 with cascading setup so that when the database generates the "real" IDs the updated values are propogated to the child tables automatically. Is LINQ going to use the same pattern? Notice above how you don't need to set the PK/FK directly. Instead, the PK/FK values automatically get set when you call SubmitChanges() - which makes it much easier to handle this type of multi-object insert. >>>>>> Do you have any plans to give us a blog on how to use Linq in a stateless environment like ASP which we need to use Attach(). From reading the docs, I still haven't got a clear picture how Linq technology should be used when DC has a short life, but in reality, we need to preserve it's state before it goes away, for the next sessions. My Multi-Tier blog post (which will come after the next 3) will explictly cover this scenario and how to use the Attach() method to do it. 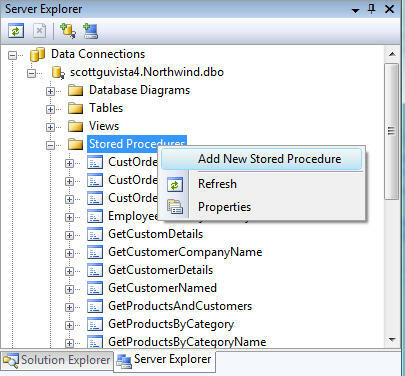 >>>>> I suppose this is a bit of an old chestnut, but, in general terms are there performance benefits in using Stored procedures as compared with using dynamic SQL? In general SPROCs won't give you a performance difference if you are executing equivalent SQL logic (standard selects, updates, inserts, deletes, etc). SPROCs can sometimes allow you to execute multiple statements together that work on data closer to the database (since they are running in SQL), which is where you can potentially see some gains depending on what you are doing. SPROCs also in theory allow DBAs to tune more - since they can review them and create index plans without having to look at C# or VB code they don't know. On the downside, SPROCs are usually much more time consuming to create when you are building a rich object model for your data layer, and end up being much harder to test and refactor. That is why a lot of people prefer ORM approaches today - they can provide a lot of productivity benefits. >>>>> As my understanding, LINQ to SQL is a layer sits on top of ADO, it parse "lambda expressions" to sql expression and using ado provider to execute the sql query? LINQ to SQL is an ORM that uses ADO.NET internally. 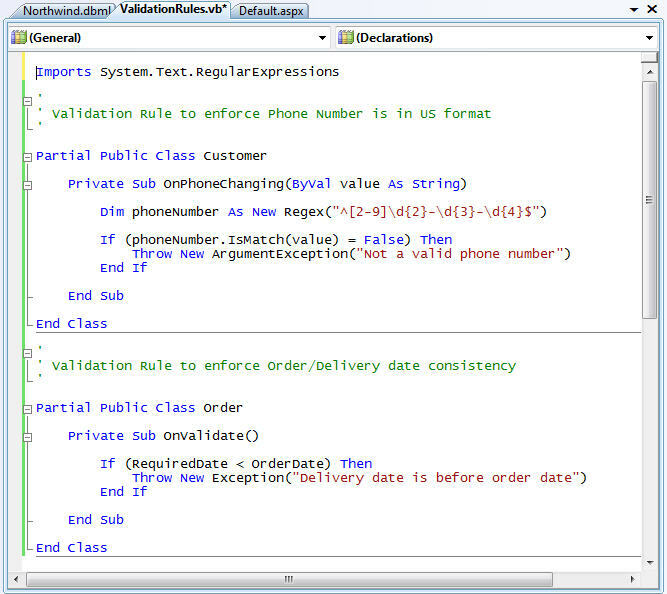 It can automatically translate LINQ expressions to dynamic SQL to execute. >>>>>> Can LINQ scale to Millions of Oracle DB Rows? If I wanted to convert my existing high performing oracle sp calls to LINQ compatible where do I start? LINQ to SQL doesn't currently have a provider for Oracle yet, but I believe one is being built for LINQ to Entities (another ORM provider from Microsoft). Hopefully in the next few months you'd be able to try this out. >>>>>> I noticed that the generated code tries to change table names from plural to singular (it removes the s). For example, if I had a table called Customers, the generated code would show Customer. However, when I added a table called CustomerStatus, it removed the s and changed it to CustomerStatu. This seems to be a bug. In any case, I always use the singular form for my table names. Is there a way to disable this feature? You can solve this one of two ways: 1) Manually modify the name of the class that you generated within the designer. If you have only one or two tables that fall into this bucket that might be the best approach to use. 2) Alternatively you can use the Tools->Options menu and select the Database Tools->O/R Designer node and turn off the automatic pluralization support. >>>>>> Unfortunately I don't think there is anyway to automatically remove the prefix in the VS 2008 tools. I know a few companies are already working on LINQ to SQL automated extensions to VS 2008 that might handle this though. >>>>> Is there any reason you didn't use the following, which more closely resembles the C# code? >>>> Function() is the VB equivalent of =>, if I'm not mistaken. I could have used the VB Labmda equivalent instead (which you have above), but I've found a lot of VB developers are still new to that syntax, and so doing it via the query syntax feels a little more understandable. They ultimately execute the same logic at runtime - so either works. In cases where the relationship between two entities is (n:1), LINQ to SQL does a JOIN as opposed to separate queries since these tend to be safe from a data explosion perspective. In the case of a 1:n associations, LINQ to SQL only supports joining-in one 1:n association per query. You'd find that only 1 query is executed against the SQL database for everything (even though you are bringing back all of the Products and their associated Category and OrderDetail information). This is because the product->category relationship is (n:1) and the OrderDetail->Order relationship is (n:1) and so both are automatically joined in. The reason the relationship in your blog post above is generating multiple queries is that you have two (1:n) relationship (Customers->Orders) and (Orders->OrderDetails). 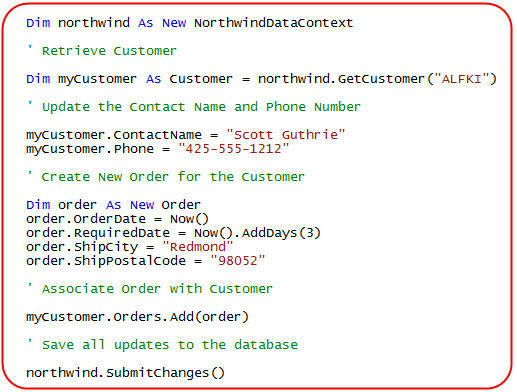 If you just had one (1:n) relationship (Customer->Orders) or (Orders->OrderDetails) LINQ to SQL would optimize and grab it in one query (using a JOIN). Can you send me email (scottgu@microsoft.com) about this M:M question? I can then loop you in with a few folks from the LINQ to SQL team to get the best opinion. Hey Scott, I hope you'll consider making a post about how to create a good BLL with Linq - or if you have a good place to read? Is there any way to execute the business rules (as you've defined them above) without actually doing the update? There are some occasions where I'd like to validate the data first without doing an actual update yet. Egergo, I am just starting out with LINQ with a view to move a vb6 project over to .NET This sounds like a scenerio that I will encounter in this move as there are about 5 or 6 places that the app does a M:M join. Can you please post whatever you find out here for us all to view. I've made a few measurements according to the join issue, and I found out that the CROSS JOIN queries are slower only when they are generated with LINQ. When I compared the CROSS JOIN and INNER JOIN queries using a SQLConnection they run with nearly the same performance. My test DB, Code and Result can be downloaded from here. But I still don't understand why LINQ generates the CROSS JOIN queries. Hi Scott, thanks for these articles, its a real help while I'm learning this new tech. Question that might have already been asked: Can I somehow construct and map an enum to a lookup table in my database? So, instead of creating a class from the table, have it inspect the table contents at design time and create an enum. I can think of architecture arguments both ways for doing this, and it won't be the end of the world if I can't, but I'd like to know if its possible / feasible. You mention that optomistic concurrency is automatically handled. However, when using Stored Procs, this is not the case (unless you are leveraging a Timestamp column). Since the OnTUpdate and OnTDelete no longer reference the originalValue, we can't pass this ourselves to the proc to manage our own concurrency. That option existed in the beta1 implementation (admittedly, it was mapped backwards at that time). >>>>>> Is there any way to execute the business rules (as you've defined them above) without actually doing the update? There are some occasions where I'd like to validate the data first without doing an actual update yet. When you add the propertychanging partial methods, these will execute everytime you set a property on them (so no need to submit). I need to investigate some more to see whether there is a way to externally trigger that (you could ceretainly add your own helper method to call it though). >>>>>> You mention that optomistic concurrency is automatically handled. However, when using Stored Procs, this is not the case (unless you are leveraging a Timestamp column). Since the OnTUpdate and OnTDelete no longer reference the originalValue, we can't pass this ourselves to the proc to manage our own concurrency. That option existed in the beta1 implementation (admittedly, it was mapped backwards at that time). You can then use this for optimistic concurrency. I'll cover this in my upcoming optimistic concurrency post. >>>>> My question is what happens in Linq to SQL when the proc returns multiple result sets. 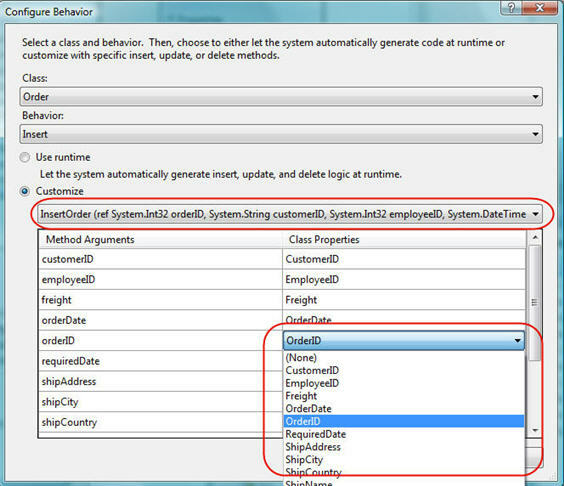 For example lets say I have a proc that returns active orders for a specific sales account. In my last blog post here: http://weblogs.asp.net/scottgu/archive/2007/08/16/linq-to-sql-part-6-retrieving-data-using-stored-procedures.aspx I talked a little about the IMultipleResult interface that gets passed back from a SPROC. You can use this to handle scenarios where you return multiple results. >>>>> Can I somehow construct and map an enum to a lookup table in my database? So, instead of creating a class from the table, have it inspect the table contents at design time and create an enum. Right now the LINQ to SQL designer doesn't automatically support this - but you could in theory run your own tool to auto-generate an enum for this. I'd recommend being careful, though, since database cotents can change and you might find youself burning in stale data to enums if you aren't careful. Man, I need to start reading these LINQ articles or I'll never catch up. Thanks for all the great information. Your blog is my first stop for good ASP.NET tutorials. Thanks for the reply scott - I agree generated enums are probably not a smart architecture idea. :) Another quick question: Can one easily hack into the code generation for Linq to Sql and substitute or add in their own code? Or should one just go out to third party tools like MyGeneration for this sort of thing? Another great post! I have a 'slightly' unrelated question though - how similar will the Entity Framework be? How easy will it be to migrate code written against LINQ to SQL to LINQ to Entities? Will a tool be needed/provided? Thanks for the answer. Yes you gave me the answer I was looking for. Just one simple question - do you know any good MSSQL 2008 blog with tutorials of the same quality as yours? Are there anyway to query an entity without using lambda expression in C#? I try to build the examples and follow along. So I built the data model. Then I read the part about the version column on the Customer table. So I added it. Went along with the rest of the example, and discovered my update didn't. Realized it was because my Customer table in the model was added before I added the version column. Deleted the table in the model, added it again, and all worked. Is there a better was to 'refresh' the model to reflect the schema? >>>>>> Is there a better was to 'refresh' the model to reflect the schema? Unfortunately there isn't a refresh mode in the LINQ to SQL designer - so deleting the table entity and re-creating it is probably the best approach to take. >>>>> Are there anyway to query an entity without using lambda expression in C#? >>>>> Just one simple question - do you know any good MSSQL 2008 blog with tutorials of the same quality as yours? Unfortunately I don't know of any SQL 2008 specific blogs just yet. But hopefully several will start to appear as we get closer to SQL 2008 ship date. >>>> I haven't seen how to do inheritance the way I would like to see it. I have a master table "Component" that stores items such as Server, Network Card, Storage Unit etc. The Component table stores most of the component information such as the name, ip address etc. The Server, NIC and StorageUnit tables extend that table and have a foreign key reference to the ComponentID. Using Linq, how would I go about having a Component C# class as a base class and Server, Nic and StorageUnit classes as derived classes? The information is not all stored in the Component table so cannot use InheritanceMappingAttribute (unless I'm mistaken). LINQ to SQL supports Single Table Inheritance (which I'll be covering in my next LINQ to SQL blog post), but doesn't natively support multiple table inheritance. What I think you could do, though, is to model a logical entity using SPROCs for querying, inserts, updates, deletes. You could then automatically shred the data into the appropriate tables within the SPROC layer. I haven't tried this myself yet - but in theory it should work.